Main Street Capital (MAIN) is a popular income-investor Business Development Company (“BDC”) because it offers an attractive 6% yield, and both the dividend payments and the security price have been increasing significantly for years. This article briefly reviews the company and its many attractive qualities, then gets into the big risk factors that investors should be aware of. We conclude with our views on whether MAIN is still an attractive security to own or if it’s time to look elsewhere. The above chart provides perspective on the strong performance of MAIN versus the S&P 500 and a BDC index. Located in Houston Texas, MAIN has over $4.0 billion of investments under its management. The company invests mainly in the debt (and some equity) of middle market companies (i.e. companies with annual revenue between $10 million and $150 million). Its objective is to maximize total returns by generating current income and capital appreciation. Here is a look at some high level metrics to give you a better idea of the diversification of MAIN’s business. Aside from the growing dividend and significant historical share price appreciation, Main Street has a variety of attractive qualities, as described below. As shown in the chart above, MAIN’s NAV per share has been growing, and this is a good thing for investors. It means the company has been growing its book of business, and it also means they’ve not been particularly dilutive to shareholders as they’ve been growing (this is also a good thing). MAIN’s growing distributable net investment income is also a good thing. It means MAIN’s investments are spitting out more income that can be distributed to investors in the form of dividends. Note DNII is higher than the dividend, another good sign in terms of dividend cushion, safety and growth. 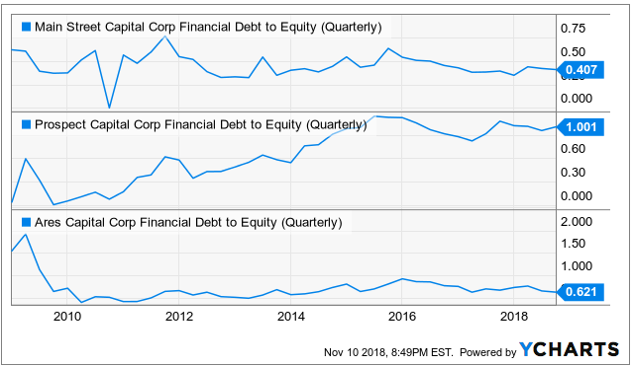 MAIN’s lower debt-to-equity, relative to peers, as shown in the following graphic, means the company has more dry powder to survive distress and potentially even be a buyer when distress hits (i.e. they could have the luxury of being able to invest at “fire sale” prices when other s are being forced to sell at low prices. In addition to being well-run, MAIN is internally managed, unlike most of its peers, which are externally managed. The internal management team helps align investor interests with management, and it helps keep management fees lower and more reasonable. For perspective, inside management also invests in MAIN, as shown in the following table, which is another good sign. For more perspective, and for what it is worth, the Wall Street analysts covering main have been increasing their price targets, and they are recommending “hold” or “buy,” as shown below. In addition to the attractive qualities of MAIN, it is important for investors to NOT fall in love with the security, and to instead consider the big risk factors too. We have highlighted a variety of big risks below that investors may want to consider. MAIN has a very high valuation, as measured by its price-to-book value, especially relative to its peers. For example, this next chart shows that MAIN’s price-to-book is significantly higher than other large BDC peers. A couple important things to keep in mind. First, MAIN is considered by many to be a higher quality BDC relative to peers, and for these reasons it deserves a higher valuation. In our view, there is some merit to this argument, based on its attractive qualities as described earlier. For more perspective, this next chart shows the price-to-book values of a universe of BDCs compared to each other and compared to their own historical ranges. While MAIN is more expensive than peers on a price-to-book basis, it’s still near only the middle of its own historical range. We’d be remiss not to mention the dangers of high-yield chasing, particularly with regards to the BDC industry. Many investors understandably hate market volatility, and thereby prefer the comfort of owning steady big dividend payers to help them sleep well at night. To an extent this is true, but when yields get too high that’s often a sign of distress. For example, if you look under the hood of BDCs, they almost all own mostly high-yield debt. Specifically, they own debt that effectively falls into the “junk” bond category or worse. These are the loans that are too risky for regular banks to own. Now MAIN’s yield is lower than the yield of many BDC peers (see chart above), and that’s a tribute to its conservative (for a BDC) management. But let’s not forget, the industry often sells off very sharply all at once regardless of company specifics, and that is a big risk for MAIN. It’s important for investors to not concentrate all their investments in one sector or asset class (such as high yield BDCs). And for more perspective on our views about the dangers of “yield chasing” check out our article: The 7 Deadly Sins of Long-Term Investing. Near the start of this article, we provided graphics showing MAIN’s diversification across sub-industries ang geographies. And one risk factor, in particular, to keep on your radar, is the energy sector. MAIN announced earnings about a week ago, but that only included data through September 30th, right before energy prices started their steep declines. For example, the following chart shows MAIN shares performed well following the earning announcement, but that only included data through the end of third quarter—right before energy prices began to sell-off. While only around 10% of MAIN’s sub-investments are in Energy Equipment (7%) and Oil & Gas (3%), 27% of the business is located in Texas and the surrounding areas, a region where the economy has an outsized dependence on the energy industry. Recall also, MAIN is based in Houston, Texas. This is a risk factor to keep on your radar as it could add to negative volatility in the coming months, particularly if energy prices remain lower. Also worth mentioning, credit spreads (as we’ll cover in a moment) have a significant correlation with energy prices, and since BDCs are essentially high-yield credit vehicles, an energy sell-off could have a pronounced negative impact on MAIN. MAIN regularly cites its investment grade credit rating, but if you look at the underlying investments, as we mentioned previously, they are not investment grade—they are essentially “junk.” Here is a look at the historical performance of a BDC index (BDCS) versus a junk bond index (HYG), and as you can see, BDCs track junk bonds very closely, and not the broader equity market as measured by the S&P 500 (SPY). For more perspective, here is a look at the historical performance of some of the bigger BDC’s versus credit spreads for low quality debt. When credit spreads rise (i.e. when investors get nervous about economic strength), BDCs sell-off. Importantly, credit spreads currently remain very low by historical standards, but considering the recent bout of market choppiness over the last month, credit spreads could “blow out” thereby having a very negative impact on BDCs, including MAIN. In our view, if credit spreads widen significantly, that is the biggest risk factor for MAIN considering they own (like most BDCs) mainly very low quality loans which are most sensitive to economic weakness. If credit spreads widen, this could quickly turn into a much larger number, and this is a big risk that investors should be aware of, in our view. In the BDC world, MAIN is high-quality (relative to peers), it offers a conservative dividend, it uses a conservative amount of leverage (therefore they could actually be fire sale buyers not forced sellers during times of distress—a good thing), and it has much more financial strength than many of its peers. And arguably, its high valuation (price-to-book) is warranted. In our view, MAIN is not a bad buy now, but it could quickly become a much better buy if the precipitous big risks flair up. To be nuanced, if/when credit-spreads blow out or the energy sector continues to be in sold-off conditions, MAIN will likely become a “baby thrown out with the bathwater” because it’s higher quality than peers, but it will likely sell-off indiscriminately with the rest of the BDC market. We’ve seen a little bit of this in recent weeks as market fear/volatility has increased and the energy sector has been challenged, but we could see a lot more if these precipitous risks intensify. Overall, MAIN is a decent buy now, it could become a much better buy soon (keep it on your watch list), and remember not to concentrate all of your investments in risky high-yield segments of the market (such as BDCs) because that’s too much risk in one place, in our view. Older PostBlue Harbinger Weekly: Omega’s 7.3% Yield, Has Risk-Off Gone Too Far?